How often should you be posting across Social Media? This is a question I have to discuss with my clients all the time, everyone wants tons of posts despite what may actually be best for their brand. Thankfully SumALL has come to the rescue putting a 2015 survey on the results of posting daily into a beautiful infographic that I can now share with you. And though all brands may vary on what they can get away with I think this is a good indication that no… Facebook is definitely not where you should post 30 times a day, unless you are a public figure or an Online / Retail clothing store. Everyone knows getting that editorial schedule out in time can be a hassle. Though I love to work with mine in excel to have links etc available easily, most clients aren’t able to visualize the overall plan by that method. Though I create and organize my calendars directly through buffer incase you need an easy way to kick start your template I have to share this amazing FREE download with you. Just click here to simplify your planning today. An editorial calendar is a way for you to plan your content. This includes your blog, social media, and all other marketing campaigns that contain your exclusive content. 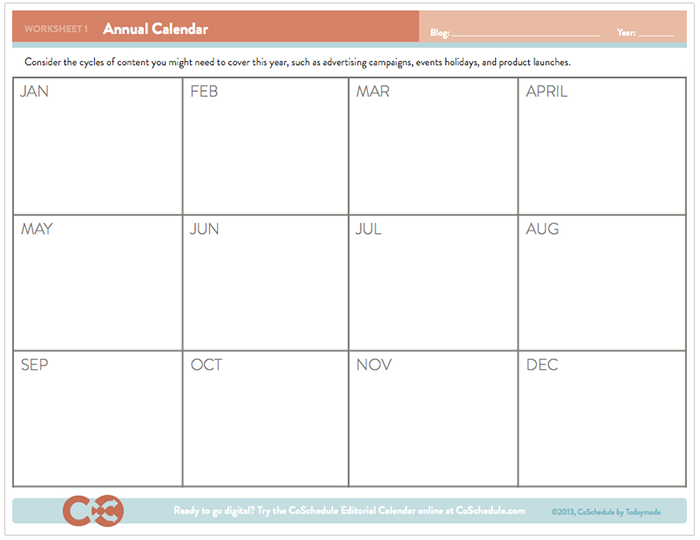 This free paper editorial calendar template can help you start the habit of using an editorial calendarto plan your content marketing. The process of using an editorial calendar is simplified if broken down into three key steps. Planning the upcoming calendar year is the ultimate bird’s-eye-view. By seeing the year’s content in broad chunks without worrying about the details, you can create and identify the overarching themes that your smaller components will fit into. You can also be sure you are staying on target with what you want your content to accomplish for you. Each of these cycles might contain a broad range of content. 1. On your annual calendar, mark down the holidays that are important to your audience and your business. Include planned product launches, events, and contests. These are specific dates you don’t want to miss. You may also want to plan chunks of content that fit your niche which are not associated with specific dates that can be moved around as needed, but ought to be covered during the year. These are your content themes. 2. Next, plan the kind of content you’ll create, such as blog posts, ebooks, social media campaigns, or videos. Determine which is the best type for each calendar item. These are your content types. 3. Finally, plan the duration of the content you want to run during each of these times. Some content might start well ahead of time, some might occur only on the day of. You will want to refer to this calendar periodically. For example, you will want to task the production of the video far in advance in order to have it ready when needed. If you only plan month to month, you will miss out when content overlaps or extends beyond a month. It is also easier to lose sight of what’s coming in a month or two if your focus is on the current month only. Now that you know the broad content themes, and can also see the gaps in between, you’ll have a better idea of the specific kind of content you’ll need. Getting your team together on a regular basis for brainstorming, or encouraging them to come up with their own ideas and pooling them together using a system is necessary. Your writing team should already know the categories on the blog, and what kind of content fits into those categories. You should also let the team in on your annual calendar. While they might not care about the specifics of dates, at least they know what kind of content themes will happen in the coming year, and can get ideas accordingly. 1. Encourage your team to find ideas that fit all of the different categories on your blog. 2. Get together regularly to brainstorm and go over the ideas. Come up with headlines for those you decide to keep. 3. Create a system where team members can store, pool, and submit ideas that everyone can access. They may have ideas that other team members would appreciate writing about. Be sure your team has a copy of the annual calendar so that they can see the larger roadmap and think of ideas that would fit the broad themes. Their ideas, after all, will be what makes up the larger theme. Your monthly editorial calendar is your go-to workhorse that you’ll use daily. It tells you who is writing what, and when. 1. Using the annual calendar, begin filling in each month according to the content chunks you planned. 2. Fill in the gaps in each week so that your content publishes regularly during the “off” times. You’ll set up a publishing schedule that your team can handle and that your audience wants. It must be a perfect compromise between the two. 3. Make sure to keep each team member or blog category evenly used, if that is an important goal. A team blog has a few more things to do to make the calendar work. 1. Decide if you want your team in on the the annual calendar overview. Maybe they don’t care, maybe they do. The reason to do it would be to get them thinking of ideas ahead of time, and to have a general sense of where the blog is going. Perhaps giving them a heads-up a month at a time will be enough. 2. Establish communication and collaboration routines. For example, you might want to email your writers their assignments two weeks ahead of the publishing date so they have time to write and get a photograph. Or, maybe you’ll need to give them three weeks. You know how your team works best. Your routine should emphasize their strengths. To get started, you’ll want to print one annual calendar and 12 monthly calendars for each blog. You can print as many idea worksheets as you (or your team) need. Fill out the blog name, month, and dates as needed. A worksheet for planning out an entire year of content themes. In order to use this worksheet, you must know how many of each content type (videos, ebooks, case studies, whitepapers, infographics, etc.) your team will be producing each year. This does not include blog posts. Holidays: Note all of the holidays and events on the calendar that you might create content for. Themes: Note the themes or series you plan to create. Content Types: Note which months you will publish a video. Do the same for other content types. Some months may have more than one, depending upon the frequency you (or your team) are able to handle. White paper on changing habits. Theme: Focus on conference topics and speakers. Tip: You may write on the calendar directly, but if you might need to adjust the schedule later, use a sticky note instead. These worksheets work well with sticky notes. Collecting your ideas in one place makes it easier to plan. The ideas worksheet is optional, but it gives you (or your team) a place to store ideas and easily transfer them to your calendar. 1. Label the worksheet according to the blog the ideas are for, and if the worksheet pertains to a specific theme or event (optional). This will make it easier to track for the appropriate monthly calendar later. 2. Write ideas on the worksheet directly, or use sticky notes to make it easy to transfer to the monthly calendar. 3. Fill in the worksheet key if necessary, noting what any colors you use mean. If your monthly calendar is using color coding based on team member, the columns can be used for categories (or content types), since the color will all be the same on a team member’s worksheet. 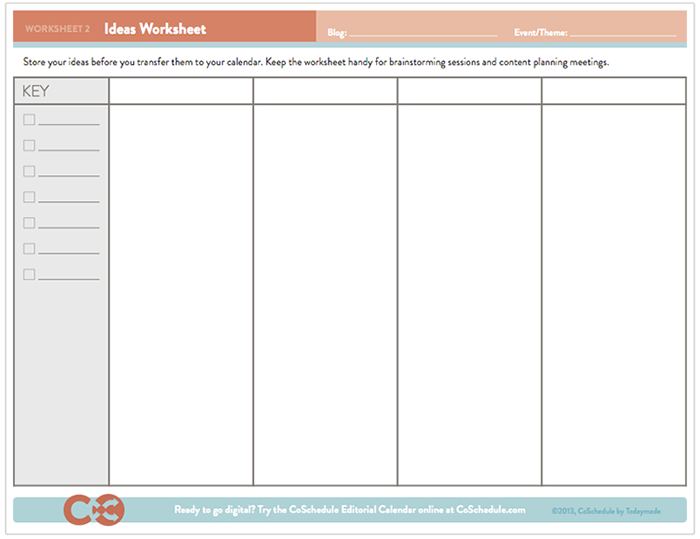 Keep the worksheet handy for brainstorming sessions and content planning meetings. Tip: Hang onto your old idea worksheets in a folder or binder. They will be helpful in future planning sessions. You can see what you’ve done, if you want to repeat content. Or, you can make notes on this worksheet about what did or did not work. Each month you’ll plan your content in greater detail. The monthly calendar will get the heaviest use. How often you intend to blog each week and what kind of coverage you’ll give each of your categories will determine how you plan a month’s worth of content. 1. Your monthly calendar should have the ideas already on it that fit the annual calendar plan. If not, refer to the annual calendar and make sure any events and themes for the month are covered. Make note of specific content types. 2. Add specific headlines and content to the calendar from the ideas worksheet. You might base your decisions on author (e.g. Jim writes on Monday) or category (e.g. every category used in a two-week cycle), and use color accordingly. 3. Fill out the key so that you (or your team) know what the colors on the calendar mean. Tip: This calendar template works perfectly with sticky notes, each square sized for a standard small sized note. Using sticky notes makes it easy to move content around on your calendar and adjust for changes. You can also write on the calendar directly, of course.